Karen House : Feb. 4, 2019, 3:31 p.m.
Valley Fest 2019 is moving from the heart of downtown Dunlap a few blocks away, to the 17-acre Valley Fest property on Pine Street (pictured above). CORRECTION 2/4/2019 9 P.M.: The date of the Valley Fest Pageant has been corrected to April 13. Feb. 4, 2019 – Popular country singers will headline the entertainment for Valley Fest starting May 4. The Georgia Satellites and Buddy Jewell will perform Saturday evening, May 4, and Guy Penrod will lead the gospel lineup Sunday, May 5, according to Chamber of Commerce Executive Director Janis Kyser. Gates will open for Valley Fest at 10 a.m. Saturday and 11 a.m. Sunday, but there are several preliminary events planned for the weeks leading up to that, including a pageant and a carnival, Kyser said. 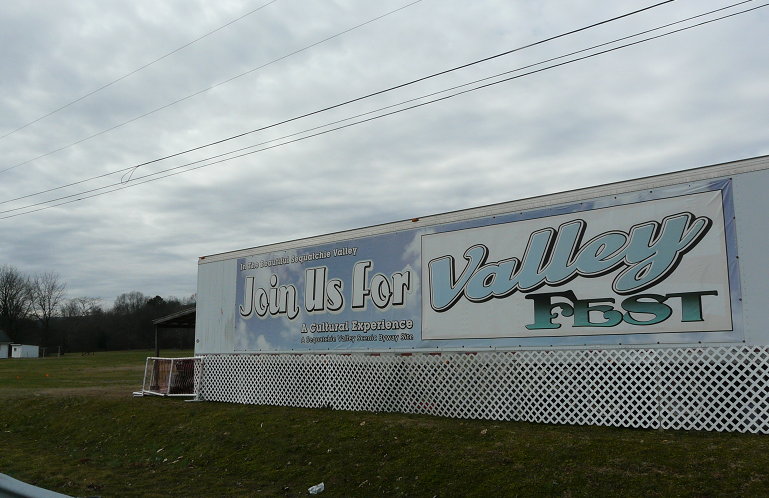 This will be the first year Valley Fest will be held on the 17-acre Valley Fest property on Pine Street, instead of the roads and parking lots in the heart of downtown Dunlap. The city is working together with Valley Fest to install a row of 12 permanent RV hook-ups on the site that will provide water and electricity, she said, and the Sequachee Valley Electric Cooperative (SVEC) is putting in a row of power poles on the side facing Pine Street, so electricity will be available to vendors. Putting in utilities at the property will make it useful for any one of a number of city or Valley Fest events, Kyser pointed out. The first ones to use the RV hook-ups will be workers for the Valley Fest Carnival, which is a new addition to the annual event. The carnival will start setting up on Sunday night and will be open for action Tuesday, April 30, Kyser said. James Gang Amusements will bring in the carnival, complete with an 80-foot ferris wheel. But the celebration actually kicks off with the Valley Fest Pageant 2019 on Saturday, April 13, in the Sequatchie County High School auditorium. Trophies and scholarships will be awarded to pageant winners. Any female student 17-21 years of age, and a resident of the Sequatchie Valley (Marion, Sequatchie, and Bledsoe counties) may enter the pageant. Because the carnival will be set up all week, vendors will begin setting up Thursday evening, May 2. There will be dozens of vendors during the week of Valley Fest, Kyser said, along with an “old-timey photo booth,” and a miniature train. The Valley Fest Opening Ceremony is scheduled for 2 p.m. Saturday, with the SCHS Band playing the National Anthem. The Georgia Satellites will headline the entertainment at Valley Fest May 4-5.